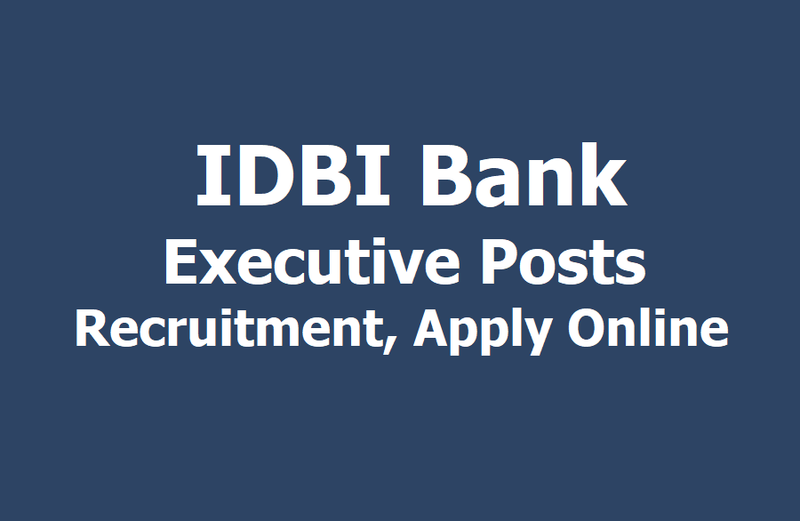 IDBI Bank 300 Executive Posts 2019 Recruitment Notification: IDBI Bank Ltd has issued notification for the recruitment of Executive vacancies and the Bank invites applications from the eligible and suitable applicants for the Executive posts to be filled on contract basis at its different Branches and Offices. 1. Applicants must be either (a) a citizen of India, or (b) a subject of Nepal, or (c) a subject of Bhutan, or (d) a Tibetan refugee (who came over to India before 1st January 1962) with the intention of permanently settling in India or (e) a person of Indian origin, who have migrated from Pakistan, Myanmar (formally Burma), Sri Lanka, East African Countries of Kenya, Uganda, the United Republic of Tanzania (formerly Tanganyika and Zanzibar), Zambia, Malawi, Zaire, Ethiopia and Vietnam with the intention of permanently settling in India, provided that a applicant belonging to categories (b), (c), (d) or (e) above shall be a person in whose favour a certificate of eligibility has been issued by Government of India. The applicant, in whose case a certificate of eligibility is necessary, may be admitted to the selection process conducted by the Bank, but on final selection, the offer of appointment may be given only after the necessary eligibility certificate have been issued to him/ her by the Government of India. 2. Those who are in the final year of their Graduation / Semester may also apply provisionally subject to the condition that, if called for interview, they will have to produce proof of having passed the Graduation examination. 3. Applicants are expected to have proficiency in Computers. 4. The Bank reserves the right to raise or modify the eligibility criteria pertaining to educational qualification (including percentage of marks secured at Graduation) and/or work experience. Depending upon the requirement, Bank reserves the right to cancel or restrict or curtail or enlarge the recruitment process, if need so arises, without any further notice and without assigning any reason therefor. As on 01/03/2019 Candidates should have minimum age is 20 Years and Maximum age is 25 years. Age relaxation to the SC, the ST, OBC, PWD and Ex-Servicemen applicants would be eligible for age relaxation as per the Government of India guidelines. Selection Process: Based on written test, online test and medical test. Candidates can apply only online and no other mode of application will be accepted.